Nebraska Destinations to Add to Your Bucket List! Are you always looking for adventure? Are you in the Omaha area? Then we have the perfect solution for you. Read about these various activities in Nebraska to help add to your bucket list. See which attractions interest you and get up and go get active! Enjoy the great outdoors as you take in Nebraska’s scenic views. The Cowboy Trail located in Valentine, Nebraska needs to be added to your bucket list ASAP! This trail runs 321 miles across northern Nebraska while following the old Chicago & Northwestern rail route. The paved trail is recycled from old train track and will one-day reach nearly across the state. The people of Nebraska and beyond visit this trail to bike, walk, jog, horse-back riding, or just to admire the outrageous views. Some of the trail is still in development, but when finished, it will be the world’s longest rails-to-rails bike trail. Many visitors also say the bridge is a MUST see! Cross the magnificent 148-foot-high railroad bridge if you dare! Go back in time and experience a unique way of vintage shopping. Make the trip to North Platte, Nebraska to shop at the Grain Bin Antique Town! This creative promenade was established in 2012 allowing guests to shop from twenty-octagon-shaped wooden grain bins full of antiques. There is a board walk that ties all the bins together for convenience and walk-ability. If you’re the ultimate vintage shopper, come out and experience some of the most historical farm items, décor, glassware, and more! It’s open year-round and welcome to all. Plan your trip to Alliance, Nebraska to see the iconic, Carhenge roadside attraction! This “Car Art Preserve” consists of sculptures made of cars and car parts. There’s no reason for the people of Nebraska not to visit this attraction, because it’s open all day and everyday with FREE admission. Carhenge is also a great viewing location for Nebraska’s upcoming solar eclipse, so plan your visit today! Reconnect with nature when you visit Omaha’s inspiring Lauritzen Gardens. This botanical center draws in all of Nebraska with it’s must see beauties. It is the ultimate place to relax as you admire the many gardens, views, and exhibits. Also maybe even discover some wildlife along the way! The gardens also offer educational programs, summer camps, and more. Make the Lauritzen Gardens your family’s next destination! Click here for hours/more information. What if you could cross a bridge and then be in another state? Well, when you visit the Bob Kerrey Pedestrian Bridge, you can! 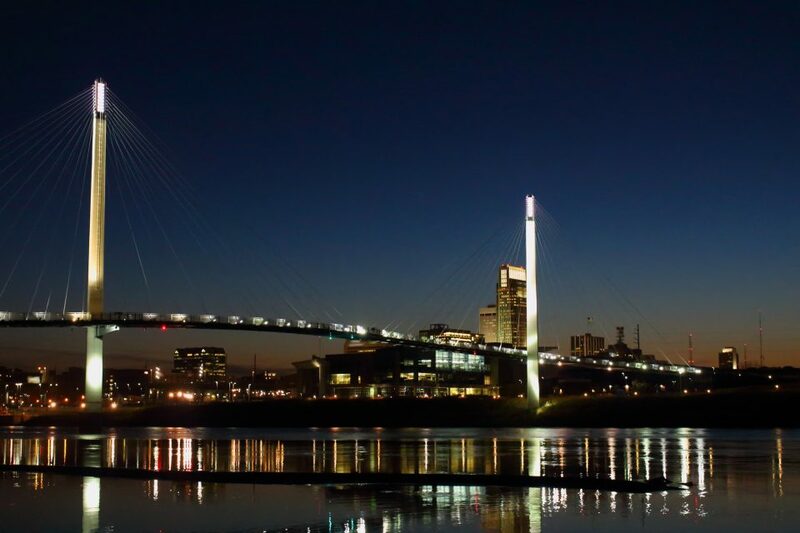 This 3,000-foot bridge crosses the Missouri River between Council Bluffs, Iowa and Omaha, Nebraska. Pedestrians come walk along the bridge to see the most spectacular skyline views. Each side of the bridge offers activities such as several trails, play plazas, and a visitor’s center. Live music is also played for guest’s entertainment! Click here for the music schedule/more information. Come out and experience what all Bob has to offer! Click here for more information about Bob the bridge. After you’re done checking some things off your bucket list, visit us at O’Daniel Honda for all of your vehicle needs. Our friendly staff will gladly assist you in finding the perfect car, today!